It should have a responsive design that’s tailored to PCs, tablets and smartphones. We’d love to have you preview the new design and let us know what you think. You can use this feedback form to send us your ideas. Since it’s a work in progress, you may see some things that don’t look quite right or aren’t working just yet. You can instantly switch back and forth between the new and old dashboard design during this test period. We’ll switch on the new design for everyone later this year. 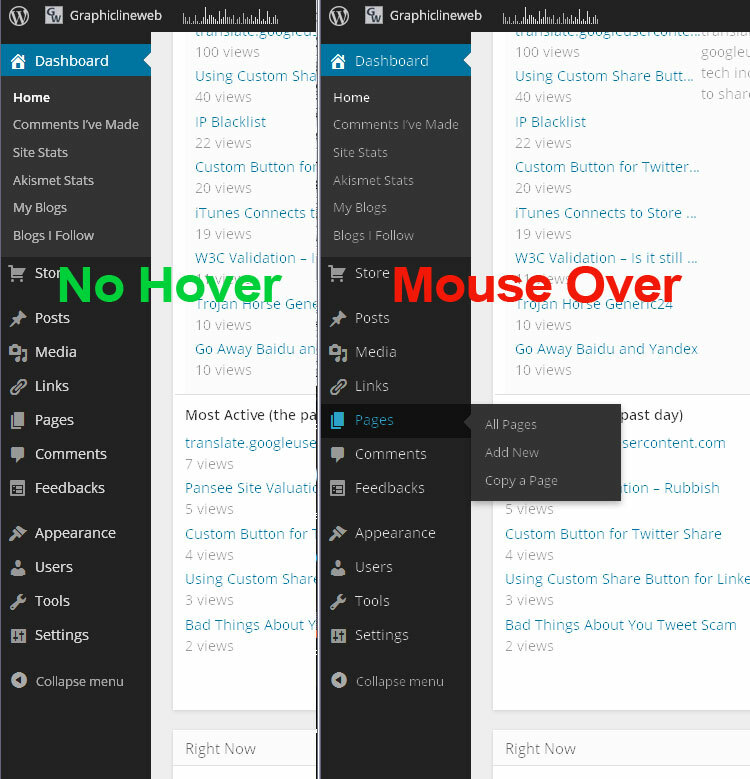 If you host your WordPress blog elsewhere, you can preview the new design with the MP6 plugin. If you’d like to learn more about how the new design was created, or you’re a designer or developer who would like to contribute, please join us on the Make WordPress UI blog. Looks quite cool. Will test it and give you guys feedback! Yeah! I get to be lost all over again!!! Yes I agree that technology is and must always be changing and improving. It doesn’t necessarily mean that it makes it any easier. We will survive the change I am sure. You can always switch back to the old design for now, but I’d encourage you to try it for a while to see how it grows on you. You should find that we haven’t actually moved any functionality, just given it a different look. Spurb design for superb bloggers. Just when I think I have something down pat – you change it. Once you give it a try, you should find that everything is still where you expect to find it, just with a different look. If you find anything harder to use, please do let us know! Wooo! I like it! I especially love the mobile theme, since I’ve been blogging a lot from my cell lately. Reblogged this on Hayden's Blog Box. This is instantly fantastic in taste, design, functionality and joy for the eye! Thanks for making a proper, beautiful, eager, aesthetic behind-the-scenes as important as what we present to the world! From what I can see, I like it. It would be nice to get a bigger picture without the phone blocking half the picture! I tried putting it into the experimental settings. It went into a loop and locked my computer solid. FYI. We haven’t noticed anything like that happen, and have tested pretty extensively on Windows, Mac, iOS, and Android devices. If you continue having trouble, definitely drop us a note at http://wordpress.com/admin-feedback/ and include screenshots if you can. I like it! Great improvement but still testing it out, I’ll let you know if I run into any issues! That’s an interesting suggestion Leslie. Our current project is limited to visual changes, but I think that’s got potential as a future improvement. Looks great. I didn’t know I could get it on my cell phone. I will add that ASAP. Thank you. Cool, can’t wait to try it out, reblogging. It’s available to all users of WordPress.com, whether you have a free or paid account. If you host your own WordPress installation somewhere else, you can install the MP6 plugin to get the new design. This is a good example of a good change–the Dashboard has gotten a facelift, but users don’t have to adjust to a new layout or build–it’s the same dashboard, just with an updated look. Much better than the “Comments I’ve Made” change. hmmm i can’t find the personal settings for users on my dashboard. what am i missing? You need to go to Users > Personal Settings to see the option. Dear WordPress team, you truly impress me. I came to WordPress for my first experience as a blogger and I don’t think now I can ever blog elsewhere. You constantly look for improvements to you great service. Bravo and thank you. Hi. Looking good but I have a concern for Android devices using the app. On the dashboard we can only see the notifications when landscape and not portrait. Which is a pain…also everything isnt formatting properly in portrait mode ..using galaxy s3. Duno if anyone else has come across this? We’re still working hard on mobile issues, so you may encounter things that aren’t quite right for a while. Rest assured we are testing with Android (and iOS, Windows Phone, and Blackberry) devices so we’ll be sure this is fixed up before the public launch later this year. Matt: Looks good so far. Suggestion: Can you add a link directly to the Dashboard from the Reader, Stats, My Blog, Freshly Pressed page? Seems like a couple of clicks are necessary to go from that page to the Dashboard – or maybe I’m missing something? Thanks Joe — links between the WordPress.com homepage and your dashboard are something we’ll be working on once the dashboard design is a little further along. “… a scrappy gang”… How I love those words! “Scrappy” might just be my favorite word in the English language. Very much looking forward to testing this new dashboard! Thank you for being awesome, WordPress. I dislike the trend of changing designs too often. We feel you there, Dennis. Give it a try though; we think you’ll find that everything is still where you expect to find it, just with a new coat of paint. I love it! It looks very nice! My only issue is that I can’t seem to find the video tutorial and the helpful links (ex: hero to zero link) that used to be at the top of the dashboard. As a new blogger, I visit them frequently. Is there somewhere else I can locate them? Very good. Liked the solid colors and it’s still very easy to use. Keep it up! So my best advise to you is: USE the KISS Method… keep it simple SAM. Tried it on Nexus7, works much better than the previous dashboard. For my mobile is the app a better choice. I am visually challenged. I make mistakes I cannot detect and that combined with false pride suppresses my commenting. Please forgive me, in advance ,if there are typos in this comment. The contrast and readability is much improved. The clutter has been reduced. There is a sporadic lag time when loading Admin pages but a left click anywhere on the page while it’s loading brings it up instantly. I’m giving this dashboard makeover a thumbs up. I’m grateful to those who have improved my blogging experience by undertaking this task. Thank you. What I am seeking now is a reliable way of gauging audience growth, as the current situation of not being able to vet followers before they follow my blog is frustrating, and there is no other reliable means of judging how many followers my content is attracting. Thanks, timethief. We’ve thought a lot about improving legibility via increased contrast, larger text, and less visual clutter. I also 100% agree with your suggestion about better information about your audience of followers; that’s great fodder for a future iteration on Stats. Ah, uncluttered – I like the notion. In my blog at least, if I can’t manage it in my life. I like the black tone, too. It’s solid. I like it! Are there any significant changes, or is just a new look? I like the color scheme and organizational flow; however, the increased text size—which will be a boon to small-screen devices or the visually impaired—is way too big on my 21″ 1080p monitor. Is there an option to maintain the new look while maintaining the experimental settings and theme? Thanks! I do all my computing + photo blogging by phone, on 3 gigs a month data plan. Your new mobile update/ re-do is horrible. Nothing on my Dashboard Users options says Personal Settings. I have Profile/Personal Options; but that screen has no “*Enable experimental admin design (MP6) *link. How to see the new Dashboard design? Thanks. Very good and responsive UI design. I agree with WordsFallFromMyEyes. Love the, “new coat of paint”. It’s a step in the right direction. I am excited to see improvements here at WP. I’m having a lot of fun here but the word ‘intuitive’ does not spring to mind when it comes to navigating your site. Hire more people who can spell ‘intuitive’. Thank you for the fun had so far. After using it about a month, it was good to see new ui here. Thanks! It looks nice and improved but I don’t know. WordPress means decent and clean. I will keep myself with whitish looks. This does looks great, because it has proffesional look. It looks like it can help me find things better, because it looks it’s more organised. The black sidebar makes it focus, and the small icons can help search things, when I’m hurry. I usually don’t like format changes, but this looks pretty good. I really like it! WordPress continues to be the gateway for ‘non-techie’ writers to dazzle, ensuring original content finds its way to an audience, I certainly did not dream of, when ‘pressing’ my first article in October 2011 – Thanks Neil Gentleman-Hobbs. From the description of its features, i think it will definitely make wordpress blogs look awesome. Thanks to the wordpress team for this new design. Nice blogging with wordpress! Matt, bit of a problem replying to recent comments…when I mouse to reply I lose the chance. Hmm… Otherwise, fine improvement. Thanks Bonnie; we’ll take a look at that. Reblogged this on Monique's FM/CFS Blog. In fact, the visual difference is, however, for the better! 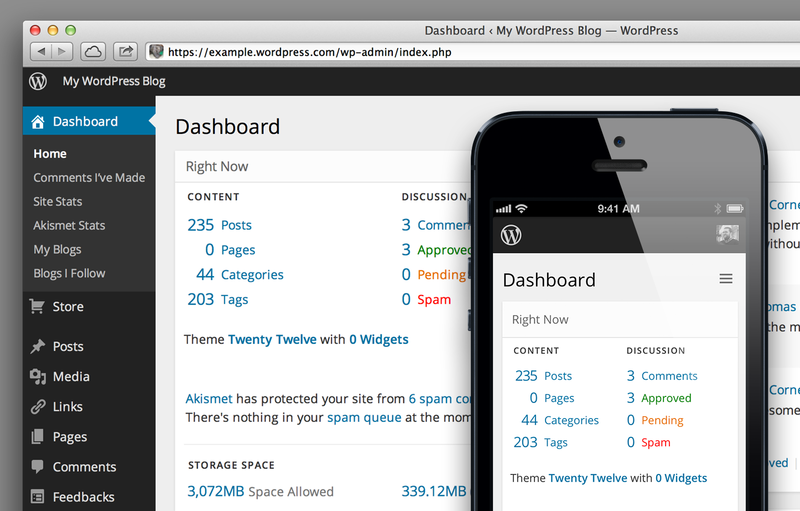 Be sure to make comments on the WordPress feedback form on the new WordPress dashboard! Make sure your voice is heard while tweaks are still being made. Reblogged this on GO-AHEAD COURSE. I like the increased contrast and the font a lot! I have blogged around a lot, but am now nicely settled in Word Press, not perfect, but no-one is perfect, and one of the most perfect. Changing the dashboard design is ok with me. It is only a design and the blog remains the same. My experience is that computer steered sites like yours change from time to time. A question of keeping up with the others I supposel Over the years I have got used to it, so just accept it. My blog is still the same, it is only the dashboard and in the computer world one thing you have to get used to is change. Be versatile, go with the times, so no problem with this golden oldie. Hello all I care about is that it is user friendly I have a hard time finding my way around sometimes. Please don’t keep changing the look of things. It’s not necessary. I’m fine with the current dashboard and consider it a negative that I will now have to become familiar with a new look. The only constant is change, they say — but we’re trying to smooth the path by letting you opt-in to the new design now, rather than surprising everyone with it at once later this year. Once you give it a try, I think you’ll find it’s a change that’s you get used to pretty quickly, since nothing’s moved from where you’ll expect to find it. Going forward, it would be nice to be able to have a calendar view for posts that helps those of us with multiple authors schedule out posts more easily than the current all-in-one-list format. Also, a simple update would pop up a calendar when in the single post editing view, so I don’t have to count on my fingers to see which date to schedule the post for. My only complaint was going to be that I don’t care for the darker sidebar, but then I collapsed the sidebar and now it doesn’t bother me. Also I LOVE the way the new Dashboard renders in iOS. I used to have to double tap to resize it, but now it’s perfect. I do find that the Dashboard still scrolls too slowly in iOS, which was the case before the redesign, so it would be great if that was improved. All in all, I like it! i like it 🙂 nice job…. I like this new clean look. Point of improvement: using black and grey is a good choice, but wouldn’t black and white be even better? It would bring much more elegance to the screen. This grey background isn’t that good for your writing mood. The changes sound great. I’m going to give it a try now with a new post. ONE thing I would LOVE is to be able to change font, color, size, and positioning (such as center) I think this would make reading more enjoyable if not overdone. It looks quite similar to the last app actualization for android. I find it so cool and ordered with that sidebar which i completely luv! "If you ever get a treasure NEVER let it go….If you are not willing to die for it when you have it you will spend the rest of your life dying for it…." I tried it out and I am glad you didn’t move things so I have a chance to start recognizing the new Icons. One addition I would like would be to be able to underline in a post. Bold and italic are fine, but, oft I want to underline. I’m currently in the process of giving it a go. So far, it looks neat, compact, easy to navigate. Thanks. I really like what I am seeing. I don’t host my own wordpress blog yet though, but I can’t wait for it. Im a massive fan of the progression of the WP admin area and where you guys are planning to go with it. Even some of the new functionality in recent builds such as the media manager and the html5 video support coming in the next build. keep it up! One has to scroll from left to right to read the page. I have changed it administratively for orientation purposes and I really don’t see much difference but then I only use it on my desktop or laptop. I can imagine the “biggy” is that it have a “responsive design that’s tailored to PCs, tablets and smartphones”. Thank you for not completely reinventing it. It look awesome, need to try this one, thanks! Hi, everything looked fine until I saw the Press It bookmarklet window. It has unnecessary extra white space and it doesn’t even look right. Hope you’d fix it. I have reverted back to the old dashboard.